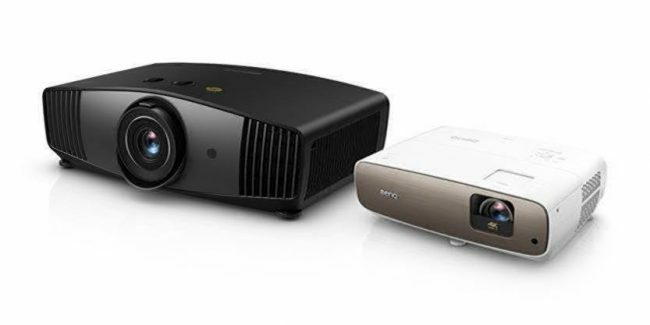 BenQ has expanded Home Cinema line of projectors and unveiled today CinePrime W5700 and W2700 DLP projectors. These are world’s first 4K home theater DLP projectors featuring DCI-P3 color. These projectors guarantee long-lasting Cinematic Color with projector-optimized HDR-PRO support and individual factory color calibration. Both CinePrime projectors claim to provide ultimate audiovisual experience with simple wireless freedom providing connoisseur-grade image quality, world-class color performance, and personalized customizability for home cinema enthusiasts. The W5700 and W2700 blend real 4K resolution with the digital cinema industry’s lofty DCI-P3 color standard, framing the ideal setting to view the latest 4K Blu-rays in glorious authentic colors as envisioned by filmmakers. Leveraging BenQ-exclusive CinematicColor technology, W5700 provides 100% coverage of the super wide DCI-P3 color space and 100% of Rec. 709 while W2700 covers 94% of DCI-P3 and 100% of Rec. 709, backed by individual factory color calibration reports ensuring Delta E3 color accuracy. The W5700 and W2700 breathe lifelike quality into 4K performances with proprietary HDR-PRO technology specifically optimized for projection. Supporting both HDR10 and HLG formats, HDR-PRO incorporates auto color and tone mapping techniques to offer superior brightness and contrast ranges as well as ideal image optimization, bringing out stunning 4K clarity and depth for vividly natural and realistic video quality. The BenQ proprietary CinemaMaster Video+ technology brings commercial quality digital cinema experiences into AV screening rooms and living rooms with motion-adaptive 4K pixel enhancement, gorgeous color enhancement, and natural flesh tone rendition. BenQ CinePrime W2700 is available at a price of Rs 2.49 lacs and W5700 will begin shipping Q1 2019 at the price of Rs. 2.99 lacs.